Just by using those two both connected to the same computer, is there a way to perform a photocopy operation by scanning via the designated scanner then immediately it being printed from the designated printer? Obviously you could save the scanned files then print them, but short of making a script or manually doing this, is there a faster automatic way through settings or third-party software? You need something commonly referred to as "photocopier software". Caveat: I have not tried any of these. 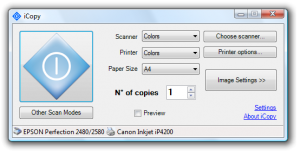 iCopy Free Photocopier is a freeware and open source application that lets you combine your scanner and printer into a powerful, but easy to use photocopier by only pressing a button. You can run iCopy by just pressing the button of your scanner!! Its simple user interface lets you manage scanner and printer options, like brightness, contrast, number of copies in a couple of seconds. As it’s small and no installation is required, iCopy is also suitable for USB pen drives. iCopy is distributed under the GNU General Public License 3 (GNU GPL v3). Not the answer you're looking for? Browse other questions tagged windows-7 printer printing scanning or ask your own question. Printing special / extended characters on web page - Firefox or printer issue? Why does my printer stop printing after a few lines and then eject the paper? How can I correct for the incorrect scaling my printer applies along the long axis of a page?